Fortunately, it is easy to stop the disorientation. All we have to do is teach the individual how to recognize when he is disoriented, and then how to use his own mind and awareness to turn off disorientation…or in other words, to become “oriented”. This is really no more difficult than teaching a child how to hold her breath while swimming underwater; it is simply a matter of learning to control consciously something that usually happens in our minds without our awareness. Over the years, Davis facilitators have developed several methods for teaching this control. The most common way is Davis Orientation Counselling, and is described in detail in the book The Gift of Dyslexia. Using this technique, the individual learns to move his mind’s eye mentally to a different vantage point until he finds the optimum point for focussing attention. This optimum point is called the orientation point. Individuals who have difficulty with the visualization approach can achieve the same effect through a kinesthetic approach, called Alignment and Fine Tuning. Both are followed by an auditory approach called Auditory Orientation. Resolving disorientation is necessary before the individual can progress; otherwise she will continue to misperceive letters and words. If one word sometimes looks like bat, and at other times looks like tab, or pat, or tad, there is no hope that the individual will ever be able to recognize the word. A parent or teacher might think that the dyslexic has memory problems and encourage drill and repetition, whereas the individual is confused and frustrated because the tutor seems to be showing her different words each time. Fortunately, the Davis methods are relatively easy to learn. Since it involves a skill that dyslexic children and adults are good at – using their imaginations – they usually catch on very quickly. Sometimes, especially with older children and adults, the results with Orientation Counselling are extremely dramatic, resulting in an immediate jump of several grade levels in reading ability. This is because, for these individuals disorientation has been the major barrier to progress. They may have already had years of remediation or tutoring. Once disorientation is resolved, all their past experience clicks into place, and progress is typically very rapid. However, learning to control disorientations does not resolve dyslexia. All that will do is resolve a key symptom of dyslexia, not the underlying cause. Until you fix the cause, the symptoms will inevitably recur. The reason that controlling disorientation is not enough to resolve dyslexia is that the disorientation is a response to confusion, frustration, or stress. In cases of reading, this response is triggered by confusion over letters or words. As long as this confusion exists, and there is no picture for what a word represents in the brain, the student will continue to become disoriented when reading. Disorientation is often caused by individual letters that are visually or auditorially confusing to dyslexics. For example, some individuals have trouble distinguishing between Q and K, because they sound alike. Some individuals have trouble distinguishing between c and e because they look alike, and some have trouble with b and d, because they are mirror images of each other. 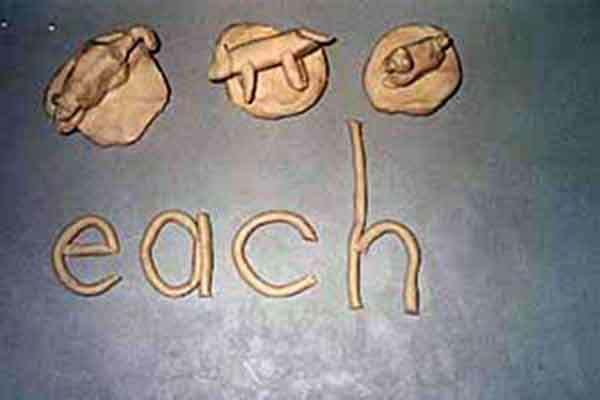 The first step toward resolving dyslexia is creation of the letters of the alphabet in clay. We use clay because it is a three dimensional medium and also involves a creative, participatory act. 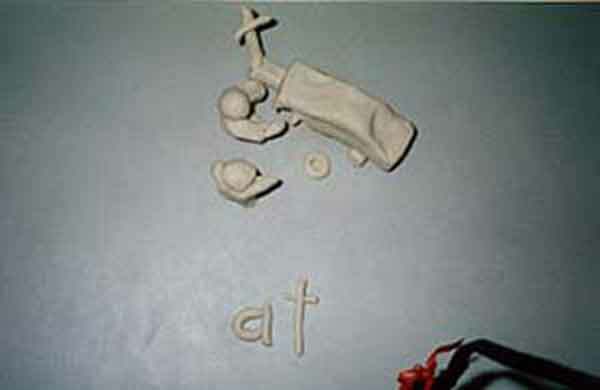 Through the molding of the letters in clay, the alphabet is no longer something arbitrary, but becomes something the individual has created, and thus becomes a part of the individual. Through observation of how the individual forms the letters and how she reacts to saying the names of the letters, we can find which are the “triggers” for disorientation, confusion, and misperception and help the individual overcome the confusion aroused by those letters. The individual models two complete alphabets, first upper case and then lower case. As each set of letters is mastered, the individual explores and discovers the shape, name, and sequence of each letter. Alphabet Mastery is followed by similar work with punctuation marks and pronunciation or speech sounds. With this knowledge, the individual is equipped to use one of the most important tools for learning that we can provide the picture-thinker: the ability to explore the meaning of words with a dictionary. The words that cause the most confusion for dyslexics are common words such as‘it’ or ‘from’. Often an individual will easily read a longer word in a story, such as‘crocodile’, but hesitate or stumble over a word like ‘the’. Because these words lead to disorientation, we call them “trigger words”. This is because the dyslexic thinks with pictures. It is easy to envision a crocodile in one’s mind, but very difficult to imagine an ‘of’ or a ‘this’. We resolve this problem through a process called Davis Symbol Mastery. After looking up a word in a dictionary and discussing a definition with a helper, the individual models an object, or set of objects, which accurately represent the meaning of the word, as well as the letters of the word in clay. This process goes far beyond the multi-sensory and phonemic awareness strategies that are commonly recommended for dyslexic learners. It engages the creative process and establishes a lasting mental image for a specific word and series of letters. It produces comprehension and long-term retention of the spelling and meaning of a word without the need for phonetic decoding or memorization. It stops the word from causing future disorientation. After completion of the Davis Dyslexia Correction Program with a facilitator, the individual continues working at home to master the list of trigger words. There are more than 200 trigger words in the English language that have to be mastered, but once this is done, the individual has developed a working arsenal of sight words – words that are both recognized and understood as soon as they are seen. All you have to do is count the number of small, abstract words in this sentence to see what a difference that will make. Once the individual has learned a method that can be applied to any word or concept, Davis Symbol Mastery can be used to master the vocabulary of any subject. The words ‘polygon’ or ‘cytoplasm’ can be mastered even more easily than the word ‘by’. Symbol Mastery becomes a tool to facilitate life-long learning. Many of my clients have been university students who used this technique to master concepts such as ‘social engineering’, and ‘marketing intelligence’. The Davis Math Mastery program uses similar methods to clear up confusions that lead to learning disabilities in Math. The Davis Attention Mastery program for treating ADD is built on the foundation of Dyslexia Correction, and includes work on specific concepts that need to be mastered to overcome ADD. These address such issues as impulse control, organizational skills, and sequencing. There are at least three causes of poor handwriting. Each has its own correction process which can be easily administered within a regular Dyslexia Correction Program.